The XL1 1-litre fuel economy car from Volkswagen uses resin transfer moulding (RTM) first devised successfully by Lotus in the UK over 40 years ago. The prototype, with its plug-in hybrid system, uses sports car design principles of low weight (795kg), sound aerodynamics (Cd 0.189) and low centre of gravity (1.153mm high) to achieve a fuel consumption of 0.9litres/100km. 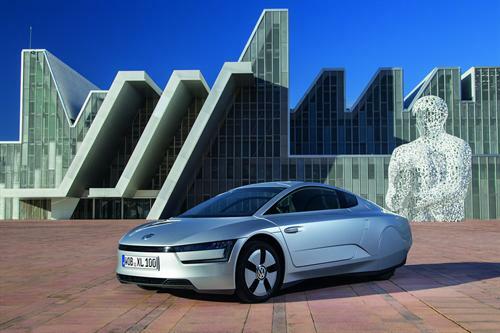 These features, combined with a two-cylinder TDI diesel of 48PS (35kW), a E-motor of 27PS (20kW), a seven-speed dual clutch gearbox (DSG) and lithium-ion battery, make it possible for the XL1 to emit 21g/km of CO2. It has a top speed of 160km/h and an all-electric drive mode range of 50km. The XL1 is manufactured by Volkswagen Osnabrück GmbH in the former Karmann facilities where some 1,800 employees produce Golf Cabriolets and Porsche Boxsters. Volkswagen claims: ”There were no previous examples of the individual production steps anywhere in the world, because no other car has been produced so thoroughly in a similar composite material”. Some might argue the technology of RTM was first successfully developed and used by Group Lotus in the 1970s when it began pioneering lightweight sports cars on a production basis. However, in the case of the “small production series” for the XL1, the specialists from Osnabrück are said to be not pursuing the classic path of large-scale production, but rather automotive “handcrafting”. Might argue this be another word for hand lay-up used by Lotus? For the XL1, VW is producing large parts in lightweight and strong carbon fibre reinforced polymer (CFRP). The CFRP is used for the monocoque body with its slightly offset seats for driver and front passenger, all exterior body parts and some functional elements such as the anti-roll bar. VW claims RTM produces CFRP components with a specific gravity of around 20 per cent of that of a comparable steel exterior skin, yet they have levels of stiffness and strength that is “by no means inferior” to that of comparable steel or aluminium parts. The exterior skin of the XL1 is no more than 1.2mm. The RTM parts are produced in multi-shell, heated and vacuum-sealed carbon material, the interior of which carries the profile of the component to be produced. The part cures afterwards in the mould. The vehicle weighs in at 795kg of which 227kg is accounted for by the powertrain, including battery. A further 153kg is accounted for by the running gear, to which must be added 80kg for equipment and a further 105kg for the electrical system. This leaves 230kg – the weight of the body produced largely in CFRP, including gull wing doors, front windscreen with thin-glass technology, and finally the monocoque.